If you’ve ever thought of starting your own business, then it’s worth listening to Dawn from @ The Salon. Fiercely independent and charmingly down-to-earth, Dawn has always been a strong advocate of doing what you love and loving what you do. 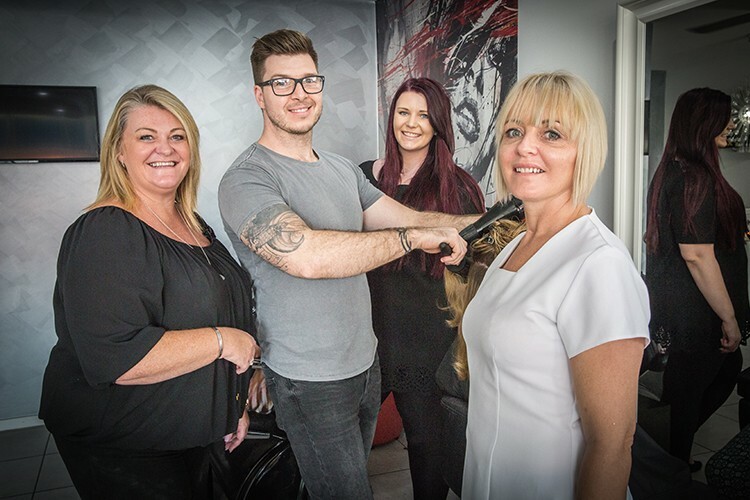 Even owning something as glamorous as a beauty salon can be hard work, but Dawn has shown us that with a firey passion in your veins and good friends by your side, anything is possible. We’re not just talking about the staff either (although we hear that they’re always up for a good laugh). Dawn has known many of her customers for years, to the point they’ve practically become family, and every one of them is willing to lend their support too. When you’ve got talent, loyalty and an abiding love for what you do, that’s when your dreams start to become something much more real… but let’s see what the woman herself has to say. Hi Dawn, thanks for taking the time to talk to us. What’s the story behind @ the Salon? My business partner and I met 10 years ago on the Sunshine Coast, and have worked together in different salons since then. We built a solid friendship and a spiritual bond that always kept us close, and we have always enjoyed that experience of working with your best friend. So we thought, why not? I think we encourage each other’s dreams but also keep each other grounded, and that makes for a great partnership. What do you love the most having a local business on the Sunshine Coast? It is an amazing place to live. The people here seem so happy and have a positive outlook – they definitely taught me to appreciate what we have. Every day I smell the ocean, breathe it in and value life. I have had bad experiences with trusting the wrong people and sub-leasing premises from another hairdresser. In that situation there’s always the possibility that someone else can pull the rug out from underneath you as they change their values. That was not something I was comfortable with, so I figured I would open my own salon. Is there any service @ the Salon is particularly famous for, or that your regulars love? We provide a full range of treatments for hair, skin and nails, and even offer injectables and advanced skin care, so we have a large clientele that come for each. It is hard to pick just one, as each staff member has their own area of expertise, so whichever service you choose, you get a top-quality experience. How do you create a salon experience that people love coming back to? I think it all comes back to our great friendship. Our team is amazing and every staff member has a real passion for our industry, so we get a real buzz from working with each other. We love a challenge and even if one person feels overwhelmed, we all support each other. This definitely filters through as our clients support us too, so it’s like a family affair. It’s important to remember we can all learn new things from each other. Do you have any advice for other small businesses who are just starting up? Love what you do, because it is always going to be hard work. If it’s all about the money then it will be a miserable journey, as the competition is fierce out there. Many home salons are undercutting what we do, and it can be soul-destroying. So you have to love what you do, otherwise you would just give up. Wise words! How important do you think it is for a local business to have an online presence on websites like True Local where customers can share their experience? Very important. Everything is online via mobile technology these days, so as a business you have to be present. It’s also a great way of getting constructive feedback on what you are doing well and what needs improving. One of the five-star reviews on your listing says “Every single team member @ The Salon is AMAZING!!! Spectacular Service, Friendly, Professional and genuine people.” Locals supporting locals is something we really believe in. How valuable have you found online reviews and feedback to you as a local business? Extremely valuable – you can’t get better advertising than a happy customer! However, it is just as important for us to see the reviews because they make the team feel good. Then they want to give everyone that same positive experience, so a great review always makes the team perform better. Speaking of customer feedback, @ the Salon does a great job of getting online reviews. What advice do you have for other businesses who might want to increase their online reviews on platforms like True Local? Involve your clients in your achievements, because we would not have a successful business without every single one of our clients. Some have been with us for years, so they have been through the whole journey with us. Always ask for feedback, and don’t be offended if it’s not a five-star review – constructive critiques give us goals to work on. We’ve noticed that @ the Salon is very active on sites like Facebook and True Local. Why do you think it’s important to engage with customers online? Everything is online now, and people are using their phones and devices constantly. Information is at your fingertips, and if a client has a good experience they will share it. It’s important for small businesses to have the support and recommendations of locals in their community. What are your favourite small businesses in your area? I always support local business wherever I can, whether it is a big trade job or small coffee shop, health shop or bakery. I think it is very important to support small businesses that employ locals. Lastly, for a bit of fun – what’s one quirky fact about @ the Salon people might not know? I would say we are just happy people who keep it real. There is no pretense here – we are who we are. We enjoy our work, and I think that shows. Our team is also a combination of Aussies and people from the UK, so we have a lot of fun with translation!